As one of Connecticut's top hair salons, Giabonni's Riverside Salon & Spa has the expert hair colorists to display your naturally cool or warm tones at their best. We provide a variety of highlighting techniques, including foils and lowlights. Each technique is customized with spot, partial or full head styling options to meet your desired look. Hair highlighting can accentuate your natural hair color, enhance your skin tone and bring out the beauty of your eyes. At Giabonni's Riverside Salon & Spa, we work with you to find your most attractive look, whether it is with red hair highlights, brown highlights or highlights for black hair. We listen carefully to what you want and have the artistic expertise to realize your unique style and vision. As one of Giabonni's Riverside Salon & Spa is proud to announce that they are one the first salons in Connecticut to provide the OYA natural hair color to their clients. OYA's unique Natural Color Support Complex features two key ingredients: Green Tea and Sea Kelp. These are powerful antioxidants that prevent premature color fading while increasing color retention. It also has inflammatory properties to reduce scalp swelling and sooth the scalp. Shimmering blondes, sultry reds, rich, lustrous browns-whatever your shade, Giabonni's Riverside Salon & Spa has color specialists that understand your hair color is an expression of your style and your personality. Whether your hair color is a natural sun-kissed blonde with hidden undertones or you use dramatic color to reflect your bold sense of style, we will create the perfect shade to complement your singular style and unique personality. 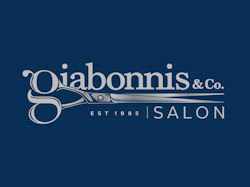 Visit Giabonni's Hair Design today a premier hair salon located in Groton and Mystic Connecticut.